Those attending the International Cyclotrons Conference beforehand should consult the CYC’13 Travel page for information on getting to the Conference hotel. TRIUMF House is located on the UBC campus about 2 km north of TRIUMF at the intersection of Wesbrook Mall with Thunderbird Blvd. From the Airport the simplest way to reach it is by taxi (about $35). 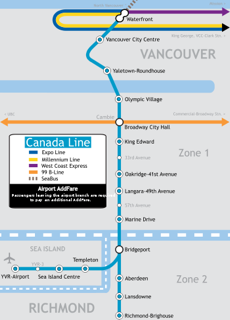 An alternative using the Vancouver Area Transit System (Translink) is to take the Canada Line (light rapid transit) to the Oakridge-41st Avenue station and transfer to the #41 bus, getting off at the Thunderbird Blvd stop. A single ticket will take you right through and costs $9 (including a $5 surcharge for travelling from the Airport). The surcharge may be avoided by using a Faresaver ticket, obtainable in books of 10 at $21from the Pharmasave or 7-11 stores on Level 1 (basement) of the Domestic Terminal. Faresaver tickets will also be useful for commuting between TRIUMF House and TRIUMF (the regular one-zone transit fare is $2.75, and exact change is required). In the UBC Village they can be obtained from the University Pharmacy or Shoppers’ Drug Mart (at 5754 and 5950 University Boulevard respectively). For a map of bus routes near TRIUMF and TRIUMF House, please see the Accommodation page.